Actinomycosis has increasingly been recognized as a cause of persistent or recurrent periapical disease associated with endodontic therapy. After conventional root canal therapy of the lower left first and second molars, a 24-year-old woman presented with a persistent periapical lesion associated with one of the sinus tracts. The lesion was surgically removed, and actinomycosis was diagnosed on the basis of biopsy results. The clinical and histologic features of this rare condition are discussed. In the case reported here, Actinomyces was identified in a long-standing periapical lesion that developed after root canal therapy and was treated by surgical inoculation. Two years later, the lesion was partially healed, and the patient was asymptomatic. A 24-year-old woman presented with an abscess involving teeth 36 and 37. Two years previously, she had undergone nonsurgical root canal therapy of these 2 teeth, followed by amalgam build-up restoration (Fig. 1). She had experienced slight discomfort and pain over the previous year. The pain was dull, coming and going with no specific trigger. There was also a history of previous sinus tract infection related to teeth 36 and 37. Shortly before the current presentation, the patient suddenly experienced severe pain with localized swelling on the lower left side. Her general dentist immediately referred her to a specialist. Clinical and radiographic examinations confirmed the diagnosis of symptomatic apical abscess (Fig. 2). Emergency treatment included incision and drainage, and amoxicillin was prescribed (500-mg tablets; 1 tablet every 8 hours for 7 days). Apicoectomy and curettage of the periapical lesion were described to the patient, who provided informed consent. Three weeks after resolution of the acute infection, an intracrevicular incision was made from the distal aspect of tooth 37 to the mesial aspect of tooth 34. A full-thickness mucoperiosteal flap was elevated, with a single releasing incision in the mesial area of tooth 34. Degranulation of the defect revealed the presence of yellowish granules. A tissue sample was obtained, placed in 10% formalin solution and sent to the oral pathologist for biopsy. To check for root fracture, methylene blue was applied over the root surface, followed by irrigation with normal saline (0.9% sodium chloride). Inspection of the surgical site revealed no evidence of fracture in any of the roots. Resection of 3 mm of the distobuccal root and Class I retrograde preparation were accomplished with 3-mm KiS ultrasonic tips (Spartan, Fenton, MO). Grey mineral trioxide aggregate (ProRoot MTA, Dentsply, Konstanz, Germany) was used as a retrograde filling material. The lingual root was not resected because of its proximity to the mandibular canal (Fig. 3). The buccal flap was repositioned and sutured to the lingual tissue with simple interrupted sutures, and the vertical releasing incision was closed with a simple interrupted suture (Vicryl 5-0 suture and FS-2 needle; Ethicon Inc., Somerville, NJ). The sutures were removed 2 weeks later, by which time the patient was completely asymptomatic, and a clinical examination revealed no sign of infection. Extraoral examination revealed no tenderness in the lower left submandibular lymph nodes, and intraoral swelling was absent. On the basis of histopathologic examination, the diagnosis was actinomycosis. In particular, the classic “sulphur granules” of this infection were apparent in the periapical lesion (Fig. 4). Two years later, the patient remained asymptomatic, and radiographic examination revealed partial resolution of the periapical lesion (Fig. 5). Figure 1: Radiograph obtained before the patient underwent root canal therapy, 2 years before the current presentation. A large radiolucency is apparent in the apical area of teeth 36 and 37. 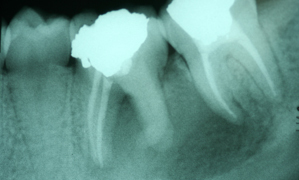 Figure 2: Periapical radiograph obtained during the current presentation (i.e., 2 years after the root canal therapy) shows a large periapical radiolucency extending from the mesial root of tooth 36 to the mesial root of tooth 37. Figure 3: Periapical radiograph obtained immediately after the surgery described in the current article. Figure 4: Bacterial aggregate from the epithelialized periapical lesion, indicating the presence of actinomycosis. The aggregate is surrounded by inflammatory cells. Hematoxylin–eosin; original magnification ×20. Figure 5: Periapical radiograph obtained 2 years after surgery for actinomycosis shows partial resolution of the lesion. Accurate diagnosis of periapical actinomycosis is possible only after surgical removal of the lesion. Prolonged systemic antibiotic therapy has been the treatment of choice for all clinical forms of actinomycosis,20 except the periapical form. Most of the reported cases of periapical actinomycosis have been successfully treated by apical surgery or extraction of the affected tooth.7 In several reported cases, no systemic antibiotic therapy was prescribed, and healing was uneventful.19,21 Happonen21 reported only one confirmed case of persistent infection following apical surgery of 16 teeth with periapical actinomycosis. Although the pathogenetic mechanism of Actinomyces has not been precisely identified, certain evidence may help to explain the nature of the infections caused by these microorganisms. Most Actinomyces species are of low virulence, and their mere invasion into tissues is usually insufficient to establish infection. However, necrotic pulp tissue offers no resistance to invasion by microorganisms, except for selective pressures exerted by environmental conditions, which are arguably adequate for most Actinomyces species. Some Actinomyces species have fimbrial structures that may play a role in bacterial co-aggregation within the root canal and that may be important for bacterial survival within the periapical lesion. In addition, these fimbriae would enable Actinomyces cells to adhere to the root canal wall and to dentinal debris forced out through the apical foramen during treatment, and to cling to other bacteria or host cells as they advance into the periapical tissues.22 It appears from the literature, including previous case reports, that periapical lesions contaminated with Actinomyces are unlikely to heal after isolated nonsurgical root canal treatment. Dr. Al-Hezaimi is an assistant professor in the division of periodontics, chair, Eng A.B. Research Chair for Growth Factors and Bone Regeneration, King Saud University, Riyadh, Saudi Arabia. Dr. Al-Hezaimi is also in private practice in Toronto, Ontario. Siqueira JF Jr. Endodontic infections: concepts, paradigms, and perspectives. Oral Surg Oral Med Oral Pathol Oral Radiol Endod. 2002;94(3):281-93. Siqueira JF Jr, Rocas IN, Souto R, de Uzeda M, Colombo AP. Actinomyces species, streptococci, and Enterococcus faecalis in primary root canal infections. J Endod. 2002;28(3):168-72. Xia T, Baumgartner JC. Occurrence of Actinomyces in infections of endodontic origin. J Endod. 2003;29(9):549-52. Sakellariou PL. Periapical actinomycosis: report of a case and review of the literature. Endod Dent Traumatol. 1996;12(3):151-4. Nair PN, Sjogren U, Figdor D, Sundqvist G. Persistent periapical radiolucencies of root-filled human teeth, failed endodontic treatments, and periapical scars. Oral Surg Oral Med Oral Pathol Oral Radiol Endod. 1999;87(5):617-27. Ricucci D, Siqueira JF Jr. Apical actinomycosis as a continuum of intraradicular and extraradicular infection: case report and critical review on its involvement with treatment failure. J Endod. 2008;34(9):1124-9. Epub 2008 Jul 24. Browne RM, O’Riordan BC. A colony of actinomyces-like organisms in a periapical granuloma. Br Dent J. 1966;120(12):603-6. Hirshberg A, Tsesis I, Metzger Z, Kaplan I. Periapical actinomycosis: a clinicopathologic study. Oral Surg Oral Med Oral Pathol Oral Radiol Endod. 2003;95(5):614-20. Hoshino E, Ando N, Sato M, Kota K. Bacterial invasion of non-exposed dental pulp. Int Endod J. 1992;25(1):2-5. Nair PN. On the causes of persistent apical periodontitis: a review. Int Endod J. 2006;39(4):249-81. Rolph HJ, Lennon A, Riggio MP, Saunders WP, MacKenzie D, Coldero L, et al. Molecular identification of microorganisms from endodontic infections. J Clin Microbiol. 2001;39(9):3282-9. Molander A, Reit C, Dahlen G, Kvist T. Microbiological status of root-filled teeth with apical periodontitis. Int Endod J. 1998;31(1):1-7. Pinheiro ET, Gomes BP, Ferraz CC, Sousa EL, Teixeira FB, Souza-Filho FJ. Microorganisms from canals of root-filled teeth with periapical lesions. Int Endod J. 2003;36(1):1-11. Borssen E, Sundqvist G. Actinomyces of infected dental root canals. Oral Surg Oral Med Oral Pathol. 1981;51(6):643-8. Bystrom A, Happonen RP, Sjogren U, Sundqvist G. Healing of periapical lesions of pulpless teeth after endodontic treatment with controlled asepsis. Endod Dent Traumatol. 1987;3(2):58-63. Ramachandran Nair PN, Schroeder HE. Periapical actinomycosis. J Endod. 1984;10(12):567-70. Peters LB, Wesselink PR, van Winkelhoff AJ. Combinations of bacterial species in endodontic infections. Int Endod J. 2002;35(8):698-702. Sjogren U, Happonen RP, Kahnberg KE, Sundqvist G. Survival of Arachnia propionica in periapical tissue. Int Endod J. 1988;21(4):277-82. Smego RA Jr, Foglia G. Actinomycosis. Clin Infect Dis. 1998;26(6):1255-61; quiz 1262-3. Happonen RP. Periapical actinomycosis: a follow-up study of 16 surgically treated cases. Endod Dent Traumatol. 1986;2(5):205-9. Figdor D, Sjogren U, Sorlin S, Sundqvist G, Nair PN. Pathogenicity of Actinomyces israelii and Arachnia propionica: experimental infection in guinea pigs and phagocytosis and intracellular killing by human polymorphonuclear leukocytes in vitro. Oral Microbiol Immunol. 1992;7(3):129-36.